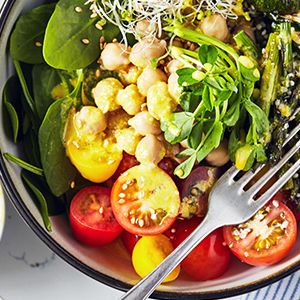 This Vegan Buddha Bowl with Spring Vegetables is perfect for the veggie-lover who want a little bit of everything. It features whole grains, nutrient-rich powerhouses like hemp seeds and sprouts, and a mix of raw and roasted veggies add color and texture. Don’t let the long ingredient list deter you. 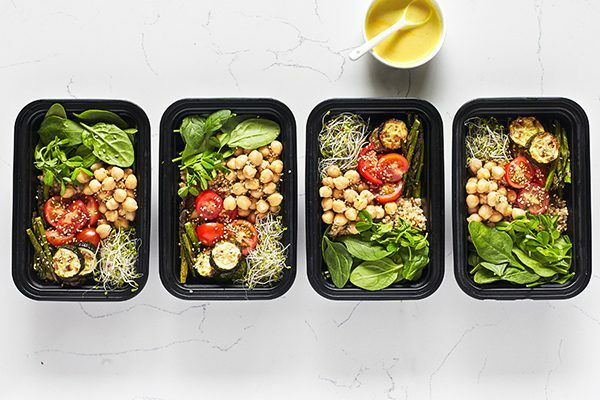 This recipe can be batch prepped for the week ahead and portioned out into your meal prep containers for easy lunches or dinners throughout the week. These bowls come together a lot faster than you might expect. As the oven heats, prep the tahini sauce. Then, pop your veggies into the oven until they’re roasted and tender. Want to streamline the process even more? Try pre-cooking the rice or quinoa. To make dressing, place tahini, lemon juice, water, turmeric, maple syrup, hot pepper sauce (if desired), salt, and pepper in food processor (or blender); cover. Pulse to blend. Slowly add 2 Tbsp. oil as food processor is running. Process until smooth and well blended. Set aside. Place asparagus and zucchini on prepared baking sheet. Drizzle with remaining 2 tsp. oil; mix well. Spread evenly on baking sheet. Bake for 12 to 15 minutes, turning once, or until tender-crisp. Cool. 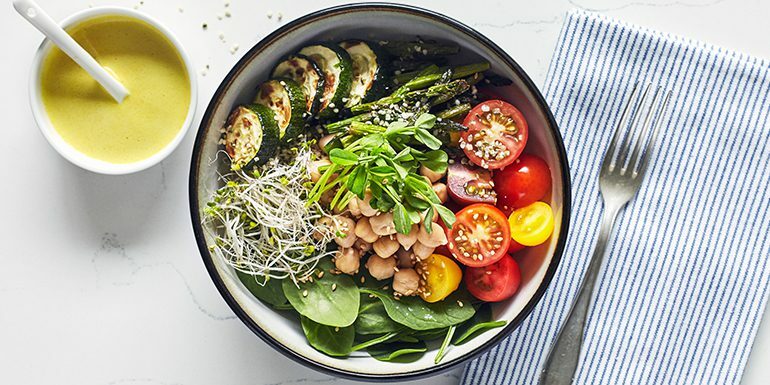 Divide quinoa, chickpeas, spinach, tomatoes, asparagus, zucchini, hemp seeds, and sesame seeds evenly between four bowls. Use your favorite fresh sprouts to add texture to this recipe. You can try alfalfa, mung bean, sunflower, lentil or onion spouts. Radish sprouts will add a little more spice to this bowl. Make sure your sprouts are really fresh. Use canned chickpeas, but make sure you drain and rinse well.